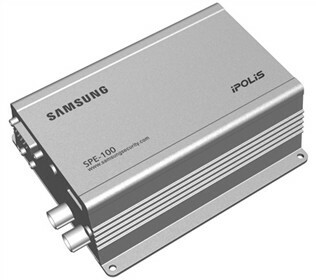 The Samsung SPE-100 is a high performing video encoder that converts video from analog cameras on to IP network system leveraging existing cost-effective analog system creating a hybrid solution. Highly efficient H.264 compression technology and ONVIF standard compliant, SPE-100 is the perfect solution when there is a need for hybrid solution. The SPE-100 enables images to be transmitted in real-time at 4CIF resolution and includes a multi-streaming feature giving the user a host of viewing and recording options. It’s multiple codec function - H.264, MPEG-4 and MJPEG gives the system the flexibility to operate in any network environment. The Samsung SPE-100 has many exciting features for users of all types. See the Samsung SPE-100 gallery images above for more product views. The Samsung SPE-100 is sold as a Brand New Unopened Item.